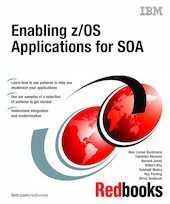 The objective of this IBM® Redbooks® publication is to demonstrate ways of enabling existing applications and data on z/OS® for integration into a service-oriented architecture (SOA). The focus is on solutions using Web Services as the underlying technology for this integration. This book describes a variety of patterns that can be applied to enabling z/OS applications for service-oriented architecture. Many of these patterns are explained by means of a sample. Each sample is included in the additional material of this book. This book is intended for readers who are interested in extending the function of their existing applications in order to benefit from SOA.